Most newspapers and outlets have a general policy against doing any major political coverage in the final hours of a race to avoid big surprises that campaigns can’t effectively respond to in time, but, hey, we’re a political news blog. Still, I can’t help but feel the tug of my former editors at my shoulder so we’ve combined everything we’ve heard over the weekend into a supplemental edition of Friday in the Sun. Independent Gov. Bill Walker went to the poll on Friday to cast his early vote, which he told reporters afterward was for Democrat Mark Begich. His endorsement support is just as tepid as it’s turned out to be all along, telling reporters that he’s not actually all that supportive of the Democrat. He repeated his similarly grudging support for the former U.S. senator when he went up to Fairbanks over the weekend, where he visited with Fairbanks Local Union 375 Plumbers and Pipefitters. His support for Begich, he said, is mostly due to his opposition to Republican Mike Dunleavy. “I was very clear in my statement of my withdrawal that I’m very concerned about the damage that Mike Dunleavy would do to Alaska and that’s why I did what I did, to make sure it was a two-way competitive race,” Walker said, according to the Fairbanks Daily News-Miner. 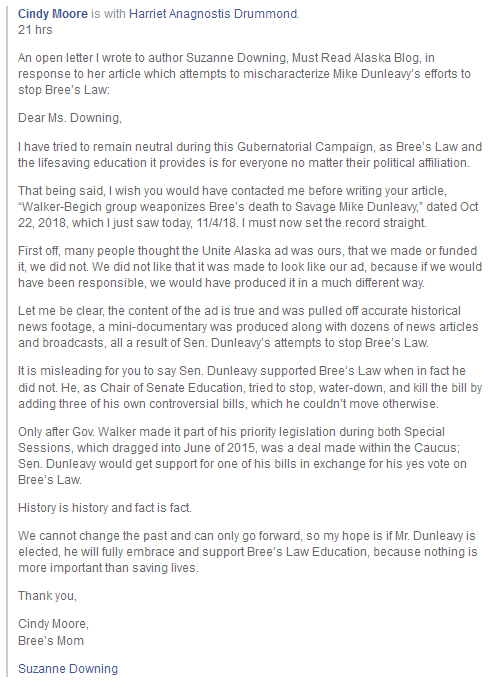 Though a lot of people would have you think that Begich and Walker get along because they both oppose Dunleavy, that’s all on the surface. From what we’ve heard the two men really dislike each other on a personal level (some of the early talks between the campaign were particularly nasty) and these recent exchanges fit into that narrative. Still, it’s even more remarkable that Walker has put that aside. We received a few angry messages about our decision to publish Amanda Frank’s guest editorial “We are not pawns” that took issue with Mike Dunleavy’s platform for rural Alaska and Alaska Natives to seem to consist largely of “My wife is Alaska Native.” To be clear, Frank’s was far from the first Alaska Native woman to take issue with the Republican’s performance at AFN and other forums. To many, 19 years in Koyuk and Kotzebue don’t really do much to comfort people living in rural Alaska when your positions include a consolidation of villages schools into a boarding school system or that English should be the state’s official language. We also saw that sitting next to him at the forum was Dunleavy, so we found his answer, which is just as problematic. Both Meyer and Dunleavy voted in favor of the 2014 bill that added Alaska Native languages to the state’s official language list. And, hey, here’s a video of Republican candidate for House District 1 Bart LeBon saying he doesn’t support subsistence rights at a Native People’s Action event over the weekend. Still, the thinking is that it’s still Dunleavy’s race to lose, but an interesting point was brought up to me over the weekend. Ask yourself, what percentage of the vote will the salmon habitat initiative get? Few expect it to win, but it’ll probably get in the neighborhood of 46 to 48 percent of the vote, right? How much of that vote would also go to Begich? For the record, FiveThirtyEight puts Begich at a forecasted 46.8 percent of the vote with Dunleavy receiving 50.9 percent of the vote. That’s the final odds that FiveThirtyEight gives Alyse Galvin of prevailing in the race against U.S. Rep. Don Young. Galvin is currently on her 40-in-4 tour, attempting to visit Alaska’s 40 house districts in four days. Young appeared on the Alaska Landmine’s weekend podcast, where he said among other things that Nixon should have burned the tapes, but what’s getting less attention are comments the Dean of the House had when he’s recalling his relationship with U.S. Rep. Charlie Wilson. 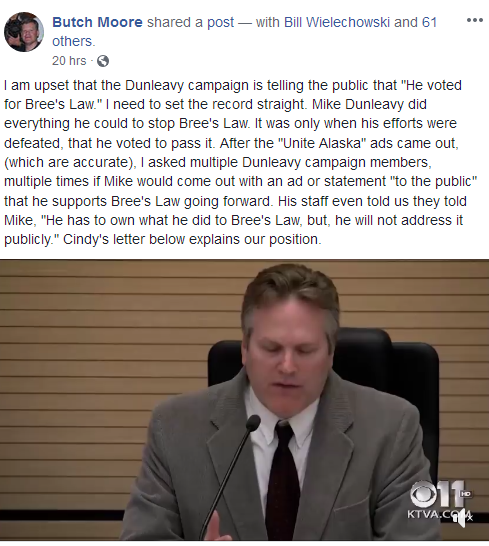 It’s safe to say that Cindy and Butch Moore didn’t really appreciate their family being used in a political ad that attacked Dunleavy’s record on the law that carried the name of their daughter, Bree Moore, but after the weekend it’s also safe to say that they aren’t fans of Dunleavy, either. Both Cindy and Butch penned posts and letters over the weekend that take issue with the revisionist history put forward by Dunleavy and the Republican Party, suggesting they were actually big fans of Bree’s Law all along and never meant to nearly kill it by loading it up with a bunch of his own personal changes. Ouch. As any Senate Republican can attest, best not to mess with the Moore family. Walker might not be thrilled about supporting Begich, but the independent governor has come out strong in support of independent house candidates Chris Dimond and Jason Grenn. Over the weekend, Walker went door-to-door for Grenn (as did Assemblyman Christopher Constant and Alaska Landmine editor Jeff Landfield). A big reason for Walker’s support of Grenn came down to the government accountability initiative that Grenn co-sponsored (that initiative also had the involvement of Midnight Sun Publisher Jim Lottsfeldt) before it was passed as a regular ol’ bill. At what point does become vote buying? Anchorage Sen. Bill Wielechowski isn’t the only person out there sending cease-and-desist letters over independent expenditure ads. We were tipped off that an ad by the union-backed Putting Alaskans First in favor of Rep. Scott Kawasaki has run afoul of the Alaska Fun and Sports Center, which sells Kawasaki Motor Corp. products. Music streaming service Spotify made some handy get-out-and-vote playlists for each state. 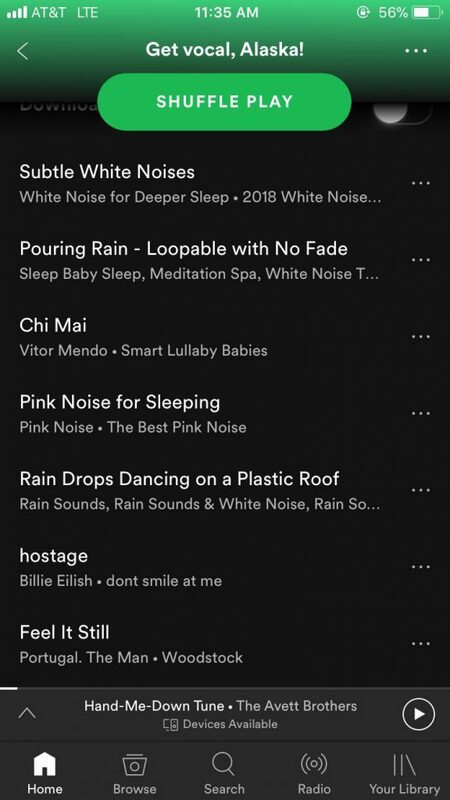 Alaska’s is, uh, interesting with bangers like: “Subtle White Noises,” “Pink Noise for Sleeping,” “Pouring Rain – Loopable with No Fade” and Portugal. The Man’s “Feel It Still.” Huh?!? Hear it still on Spotify. Hey, at least one Republican knows how to properly mix politics and music. Be the first to comment on "Monday in the Sun: The ‘I think we should respect (Alaska Native languages), but…’ edition"